I saw a recipe for an ANZAC cheesecake with caramel sauce pop up in my news feed this week. It was pretty inspiring, and I wondered if I could do my own mini version. This recipe is what I came up with. My version is gluten free, dairy free and vegan. Served frozen, these little cheesecakes have a parfait quality to them; I hope you like it as much as I do. You may remember my post about ANZAC biscuits. Well, it’s been a while since I made them. My Grandpa used to love my ANZACs. I’d send him all sorts of biscuits in the mail, but it was the ANZACs that always got eaten. When he was very ill, I spoke to him on the phone and desperately wanted to visit him but my health and finances weren’t really permitting. I told him I’d bake him some biscuits, and he asked if they’d be ANZACs. In a matter of weeks I received a phone call to say he’d had a stroke, had lost consciousness and had 24 hours to live. I was devastated. My mother said she’d pay for a flight for me to go and say my goodbyes. I took along the biscuits I’d baked. 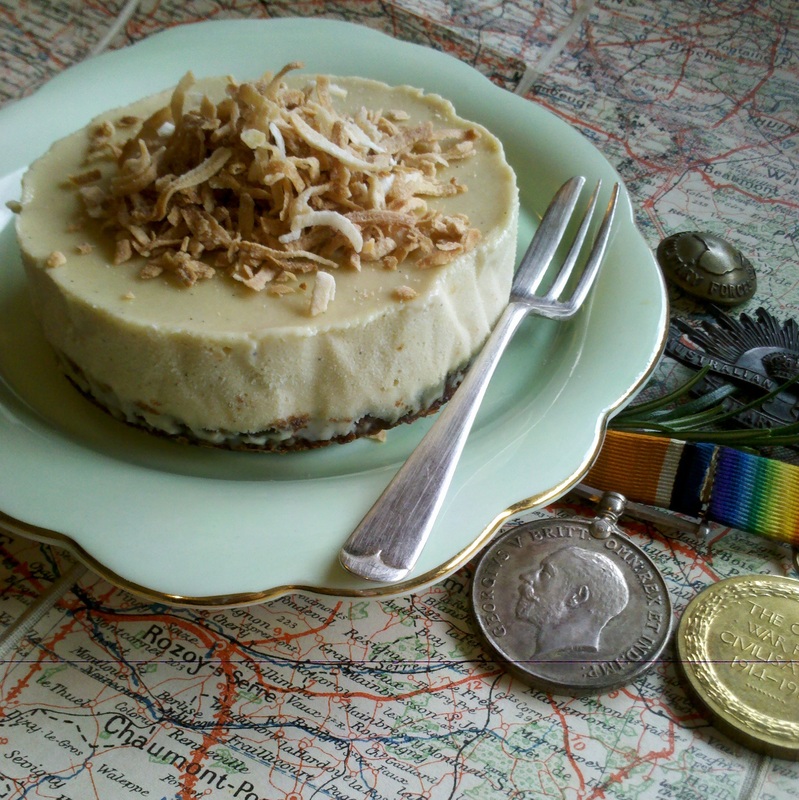 They weren’t ANZACs; they were spiced moments, topped with homemade crystalised ginger. Grandpa stuck around for weeks. We ate the biscuits in his hospital room and I’ve not made ANZACs since. But this year marks the centenary of the Australian and New Zealand Army Corps landing at Gallipoli Cove in Turkey. This landing is considered the birth place of the ANZAC legend and is the reason for ANZAC Day. We have a family connection to Gallipoli and when Grandpa died, I found a lot of his Dad’s war memorabilia including his maps of the front lines in Europe. Anyway, my dearest friend, whose ANZAC biscuit recipe I use, has a wonderful cousin. The three of us used to be very close and would go on a Christmas shopping trip to Melbourne every year. She is a very dear, sweet person and has range of food intolerances. You may remember the recipes I posted gleefully when she came to stay recently. They included a vegan gluten free crepe; tropical pancakes; and a delicious raspberry and almond chia pudding. Anyway, I had her in mind for this recipe. These little cheesecakes have a gluten free biscuit base inspired by my traditional ANZAC biscuits. I’ve adapted the layer of cashew cream from Minimalist Baker‘s 7 ingredient vegan cheesecakes to include Australia’s native Macadamia nut and sweetened the mix with golden syrup to hark back to the key ingredient in ANZAC biscuits. Topped with toasted coconut, you can serve these frozen, or leave them to soften for 15 minutes before serving. Please note that if you are preparing these for someone with food intolerances, make sure you use gluten free oats and oat flour for this recipe. Oats don’t contain gluten, but are often contaminated by gluten because they are processed in the same facilities and on the same machines as gluten containing grains. *instant porridge oats are more finely ground to ordinary rolled oats. As such, they are thinner. This will work best for the required texture in such small cakes. However, if you don’t have instant porridge oats, you can probably use traditional rolled oats. I often take traditional rolled oats and give them a very quick grind in my mortar and pestle; that does the trick. Line the base of two 10 centimetre spring form cake tins, or place a strip of baking paper inside some silicone muffin pans (I used my Tupperware muffin pan). Press the base mixture into the bottom of the pans till you have a layer about half a centimetre thick. Bake the bases for 10-20 minutes, depending on the size. You want the base to be golden on the edges. Remove them from the oven and allow them to cool completely. To make the filling, drain the nuts well and add them to a food processor with the lemon juice, coconut cream, melted coconut oil, golden syrup and vanilla. Blend till completely smooth. Pour the filling over the bases and transfer to the freezer to set. Meanwhile, toast the coconut in a saucepan over a low-medium heat till golden brown. Allow the coconut to cool. Serve the cheesecakes straight from the freezer, topped with toasted coconut or allow them to soften for 10-15 minutes. Enjoy! This entry was posted in Dessert, Morning or afternoon tea and tagged ANZAC Day, Australian food, cake, dairy free, gluten free, vegan. Bookmark the permalink.